· Anne Frascarelli’s and Teri Lucas’s quilt “Eclipse” was accepted into the traveling exhibit for the Hoffman Challenge for 2009/2010. Congratulations! · Congratulations to Mary Anne Ciccotelli for “Generations Unite” and “Grandma’s Hexagarden” and to Tamar Drucker for “Is it Digital?” and “Tel-Aviv: A View to the Past, A Window to the Future” for having been juried in to the Quilt Festival in Houston in October! Congratulations Mary Anne and Tamar, we wish you well as you make this amazing trip. · Teri Lucas will have an article on machine quilting in Quilt Scene, a special edition of Quilting Arts magazine for Houston. By the time this newsletter is published, Teri will have traveled to Ohio to tape a segment on machine quilting for Quilting Arts TV (locally on WLIW, on-air channel 21, Friday afternoons at 3 p.m.) sometime in the fall. As soon as the date is known, Teri will share that with us. · Anne Frascarelli’s and Teri Lucas’s quilt “Eclipse” was accepted into the traveling exhibit for the Hoffman Challenge for 2009/2010. Congratulations and we hope to see it at a show near us. 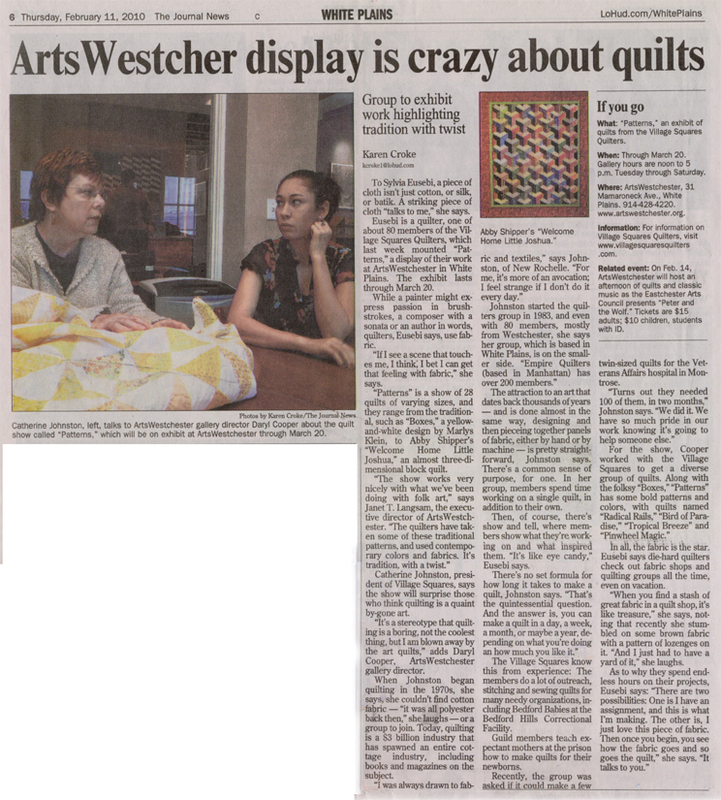 · Arts Westchester - We have an opportunity to have a showing and/or sale of our quilts and quilt-related creations at Arts Westchester in White Plains. The quilts are on display for six weeks. A show at Arts Westchester provides great publicity for the guild and allow members to have their work seen by a large audience. ·           This event continues to bring publicity to the art of quilting, our guild and our outreach programs. Susan Wolman and I will be appearing on the public access television program, “Community Views” hosted by Lorraine Buonocunto. The taping is on March 3rd and the program appears on channel 45 for FIOS customers and channel 76 for Optimum cable customers. I will announce the air times at the meeting and they will be posted on the Web site. Thanks go to member Millie West for bringing us this opportunity. ·         The “Community Views” local cable show featuring Susan Wolman and Cathy Johnston will be on Saturday and Tuesday nights at 8:00 PM. This is channel 45 for Verizon customers and Channel 76 for Optimum Cable folks. 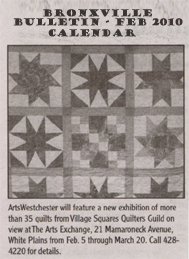 · Here is a wonderful write up about Village Squares Quilters and the Patterns show at Arts Westchester. · See the Express view of the Arts Westchester show. 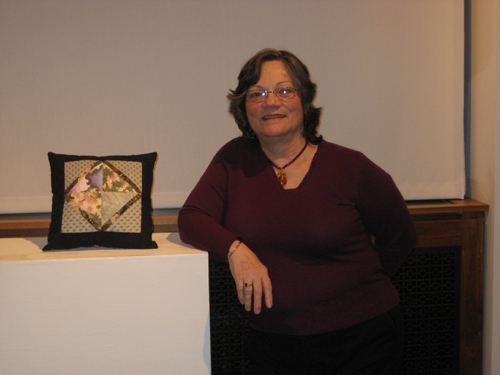 · A new wrinkle on that age-old old quilt at lohud.com and a photo of Linda and the pillow she made that her daughter took at the show. 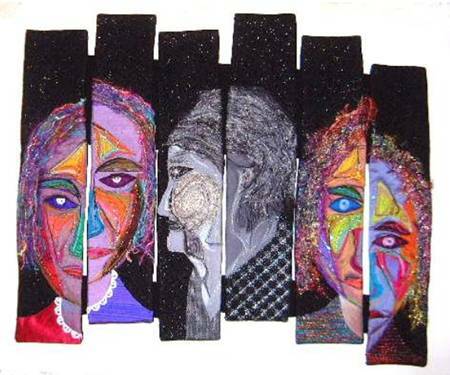 ·         needle-wielding artists is stitching up a patchwork of complex beauty. Texas, USA. Here is the link to our website:  www.elliscountyquilters.com. Our quilt show will be held July 16-17, 2010.
fabric square from your guild. If you choose to send the 8” square, could we please get it by February 20, 2010? our quilt show. Feel free to touch base with us if you have any questions. Thank you! Thank you! Thank you! I received your block today. It is FABULOUS and just we were looking for. The hand-embroidery is even more beautiful in person. We had a great quilt show and the Stitches Around the World quilts were very very very well-received. When we first started this project, we were hoping to receive enough blocks to make one quilt. Much to our surprise, we received enough blocks to make not just one, but THREE quilts, plus a table runnerl! Each quilt contains 81 blocks. We are sooooo grateful to you for your participation in making our project such a success! Here is link to our website where we’ve posted the quilts. We hope you can see your block. Again, THANK YOU so very much for your participation. · Deborah Uhlfelder’s daughter's youth group introduced her to the AFYA Foundation (http://www.afyafoundation.org) in Yonkers, NY. Afya, which means "good health" in Swahili, seeks to spread "Good Health Through Giving" and does so by providing medical supplies, consumables, sustainable equipment, and community outreach supplies to international health clinics. It was founded in 2007 by Danielle Butin after a trip to Tanzania where she encountered the dire circumstances and severely limited medical resources of their medical clinics. · AFYA partners with a network of donor hospitals, health organizations, corporations and individual households for the collection of unwanted and unused medical supplies. Fits right in with our quilt show theme of “energy.” They’re finding uses for what is considered part of medical waste. The unceasing demand from the international community necessitates a steady flow of domestic donations to AFYA. · Village Squares Quilters donated 10 cuddle quilts, 10 friendship quilts and 20 wheelchair bags to support the work of the AFYA Foundation. Please visit the AFYA Web site to see what other types of donations are needed. Deb has kindly offered to be a collection point, either in person or at a VSQ meeting, so giving to AFYA is absolutely painless. 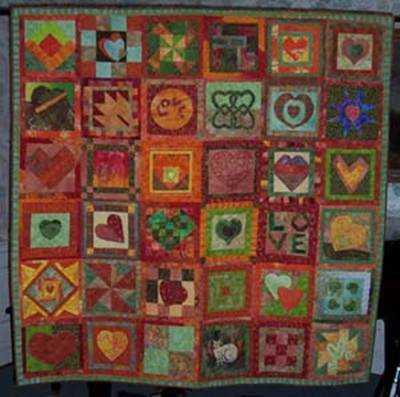 · To Love Without Boundaries Quilt: 64” x 64” hand-made quilt made and donated by Village Squares Quilters. Founded in 1983, the Village Squares Quilters Guild, based in Westchester County, is a non-profit organization that strives to promote their love of quilts and the art of quilt making. They have extensive community outreach programs including some with nursing homes, children with long-term disabilities and correctional facilities. · This project was inspired after one of their members, Rosalind Yong, visited AHC (Angkor Hospital for Children in Cambodia) in 2009 and wanted to use her love of quilting to help. This specially-made quilt is themed after AHC and features the hospital’s green heart symbol. Incorporating 42 blocks (in the front and back), this quilt took about 120 hours of sewing. It displays a variety of quilting techniques, from traditional hand-piecing and embroidery to modern thread-play by machine; each block depicting the uniqueness and creativity of its contributing quilter. As a whole, the quilt expresses every member’s attempt to reach out with love, without boundaries; unlimited but always linked. The quilt was made with blocks from 32 members and was quilted by Mary Anne Ciccotelli, a nationally-known quilter and teacher whose works have won many awards in the quilting industry. 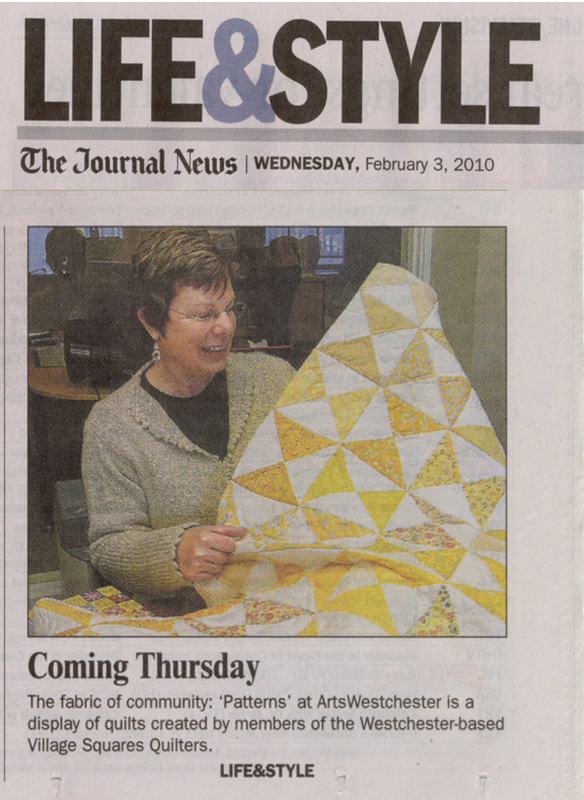 For more information about the Village Squares Quilters please visit www.villagesquaresquilters.com. the 8th Annual Fundraising Gala Benefitting Angkor Hospital for Children. At the Gala, the quilt was auctioned for $4,000. Thanks to all who participated in this worthwhile effort. spotlighted this month. Jump on over and take a look. · Congratulations to Mary Anne Ciccotelli and Sandra Parrot for their entries making it into the Hoffman Challenge Traveling Exhibit! Mary Anne entered an "Easy Does it Hexabag" and Sandra entered "Into the Mystic," an art quilt. 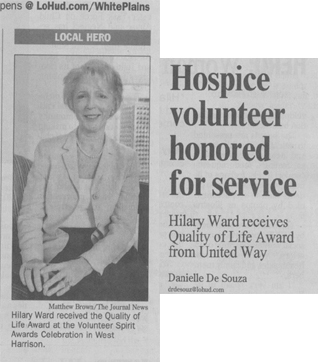 · Hilary Ward received the Quality of Life Award from the Volunteer Center of the United Way at the Volunteers Spirit Awards Celebration in West Harrison, NY. · Our Isabel Becker is exhibiting at the Rye Free Reading Room (US1 at Purchase St), Fiber Arts with Isabel Becker, from January 5 - February 12, 2010. · The fabric art work of Isabel Becker has been accepted into the juried Crafts on Stage at the Performing Arts Center of SUNY Purchase. She will bring her framed fabric pictures to the show on October 31 and November 1. Click image for full story from the Sunday, May 9, 2010 Journal News. 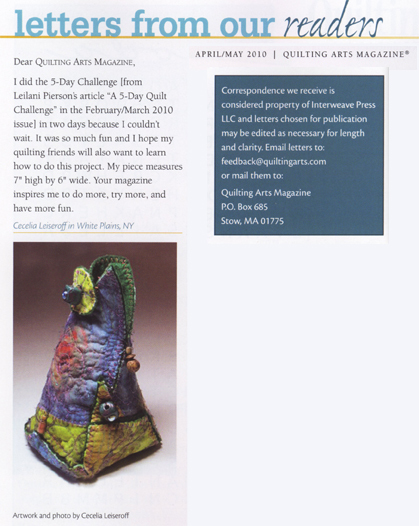 · Cecelia Leiseroff sent in a photo of the work she did on a Quilt Arts project and they printed her letter in the April/May 2010 issue of Quilting Arts Magazine . 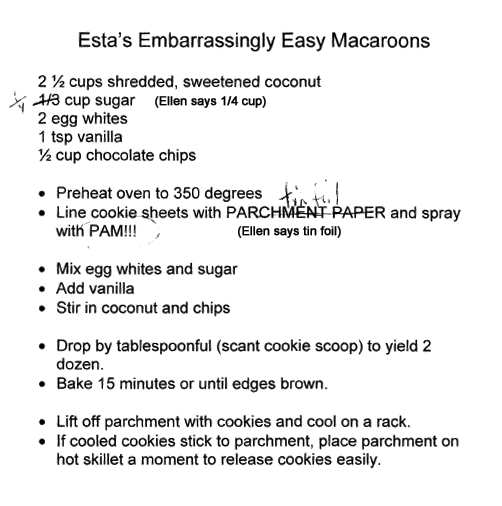 · Ellen Belson sent in her recipe for those delicious cookies. Thank you, Ellen! We're saving them in our VSQ Tidbits file.